One of the greatest spectacles in the horse racing calendar - the Epsom Derby sits alongside the Grand National and the Cheltenham Gold Cup as one of the biggest days of either the flat or jumps seasons. Officially known as the Investec Derby, it is a Group One contest open to three-year-old colts, which is run over the tricky contours at Epsom Downs Racecourse of a distance of a mile-and-a-half. Britain's richest horse race, a great national sporting event, and the most prestigious of the five Classics, is similar to the Cheltenham Gold Cup in being otherwise referred to as the "Blue Riband" of the turf. 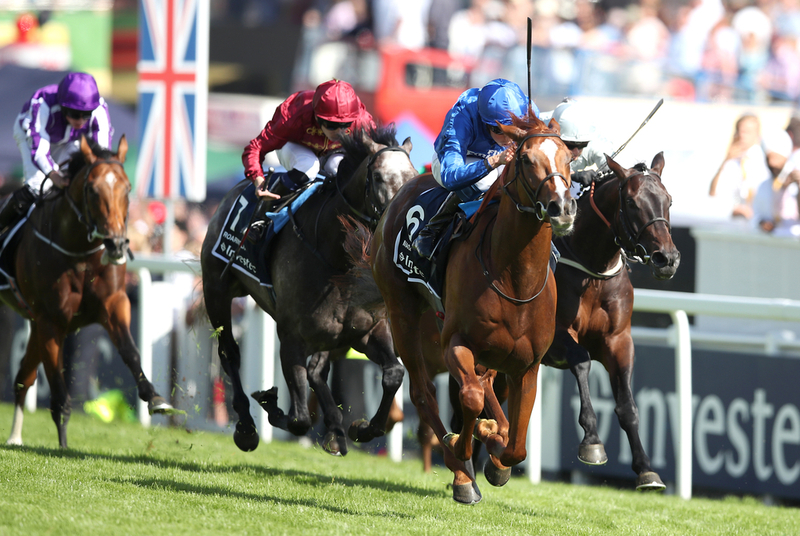 Last year, Masar faired best in the conditions at hand, delivering a first success in the race for Charlie Appleby and Godolphin, fending off the challenges of Dee Ex Bee and Roaring Lion, the latter who went onto become the Longines Champion Three-Year-Old. This season, Too Darn Hot is already a short-priced favourite for the event after an immaculate two-year-old campaign for John Gosden, but Aiden O'Brien and Coolmore will have something to say about that, with the likes of Anthony Van Dyck, Japan and Norway all looking threatening. The Epsom Derby meeting will be held on Saturday 1st June 2019. Royal Ascot is the so-called pinnacle of the Flat season, in the same way the Cheltenham Festival is for the Jumps calendar, by determining the best in the different divisions around; without the need for jumping obstacles. The Royal Meeting - held each June, is highlighted with The Ascot Gold Cup. The Gold Cup is a Group One contest held over the lengthy distance of two miles and four furlongs, and is Britain's most prestigious event for "stayers" – horses which specialise in racing over long distances. Some horses may go on and make fine National Hunt individuals down the line, but for those racing in this contest in the first place, they bid for glory of the highest order. Last year, Stradivarius won the feature event on his way to landing the Stayers Million - a prize for also winning the Yorkshire Cup, Goodwood Cup and the Lonsdale Cup in succession. He beat the French raider Vazirabad in a fantastic clash towards the line, with the 2017 winner Order Of St George back in fourth. Stradivarius looks a strong fancy for the race again this year, but could have fresh challengers in the shape of Melbourne Cup winner Cross Counter, and St Leger victor Kew Gardens in mind. Ascot Racecourse also showcases another major meeting in the summer - usually six weeks after the royal procession comes the King George VI and Queen Elizabeth Stakes. Another Group One flat race, the King George VI and Queen Elizabeth Stakes is run over a distance of one mile and four furlongs - the same distance as the Epsom Derby, but is not exclusive to three-year-olds. It's roll of honour features some of the best horses of the sport's recent history, as many of its winners subsequently compete in the Prix de l'Arc de Triomphe - Europe's biggest contest, before going on to have a successful careers at stud. Last season, Poets Word led home a 1-2 for trainer Sir Michael Stoute, who became the race's leading trainer of all time with six wins. Enable won the race in 2017 for John Gosden and Prince Khaled Abdullah, before going onto fulfil herself as one of the greatest fillies of her generation. This year's runners could see Poets Word and Crystal Ocean return to Berkshire, but by July, we may have a fresh brand of names involved in the twelve furlong category. The Juddmonte International is the feature race of York's four-day Ebor Festival meeting, and is the venue's richest race of the season - worth a purse of £1 million. The International Stakes is run on the Knavesmire over a distance of one mile and two furlongs, splitting those that manage a mile, and those that can apply themselves over a mile-and-a-half. Scheduled to take place each year in August, the International - sponsored by Juddmonte, is another contest that has been won by the greatest horses ever to step foot on the flat racing sphere. Arabian Queen was the only horse on British and Irish ground to get the better of the great Golden Horn in 2015, three years after the almighty Frankel breezed home under Tom Queally. More recently, Postponed, Ulysses and Roaring Lion have all succeeded in great style - in races that have attracted the best guns around over ten furlongs. Again, the runners of the race will be more obvious further down the season, but three-year-olds have a good record in the race due to their weight allowance, so do not be surprised if those tackling the 2000 Guineas or the Epsom Derby fill the stalls here. One of those could be the standout two-year-old from last season: Too Darn Hot, who would look to make a successful step-up to beyond a mile. The sire side would suggest he cannot do so, but the dam would. The race that caps it all off - the Prix de l'Arc de Triomphe; worth a staggering €5,000,000, is usually held on the first Sunday in October, which is towards the conclusion of the flat season. The Arc is a Group One race at Longchamp, France, ran over a distance of 2,400 metres which is the same as saying a mile-and-a-half. It is Europe's most illustrious horse race and officially the world's second richest turf race behind The Everest. It is contest that has featured many highly-acclaimed horses, all regarded as Champions. Last season, the wonderfilly Enable rewrote the history books as only the eighth horse to win it twice. After an injury-hit campaign which featured no prep run on the grass, Enable just managed to stay the distance despite the William Haggas-trained Sea Of Class flying at her late. The two are expected to lock horns once again in the race later in the campaign - both of whom are in receipt of weight from the field as fillies, as Enable looks to become the first horse to gain a hat-trick. Japan's Almond Eye certainly looks a major danger to the Brits and hosts, and is in action this weekend on Dubai World Cup night. The race has also been won by some of the best around such as Treve, Golden Horn, Found and Sea The Stars landing the spoils in recent years - the latter who is vastly becoming one of the leading sire's around. All roads lead to the Arc.